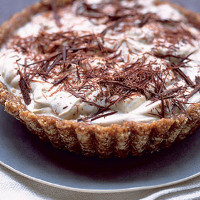 "I'd love to find a banoffee pie recipe that is not dripping with fat (for me, calories from sugar are OK as they are burnt off, but fat furs the arteries, so that's not so good!)." Caroline Clitter, Lymington, Hampshire. Banoffee pie is never going to be a dieter's dessert, but this version is certainly healthier than the traditional one, which relies on digestive biscuits and cream. An almond-and date crust is used here. The almonds do contribute a lot of fat, but only 4.2g of this is the saturated fat that concerns Caroline. The rest is mono- and polyunsaturated. Line a deep, 20cm-diameter tart tin with clingfilm. Blitz the almonds in a food processor until finely ground, then add the dates and process until you have a sticky, crumbly paste. Press this into the tin. Freeze for 30 minutes. Meanwhile, put the yogurt into a broad, shallow container and sprinkle the sugar on top (make sure you break up any big lumps). Cover and refrigerate. When you are ready to serve, take the tart case from the freezer and put on a serving plate, removing the clingfilm. Arrange the bananas over the base. Swirl the sugar (which should have partially dissolved) into the yogurt and spoon over the bananas, taking care to retain the ripple effect. Shave some chocolate over the top with a potato peeler, and serve. This pudding should be served immediately, as the almond case will begin to soften if it is left for too long at room temperature.